Sasheer Zamata made her debut Saturday as the first black female cast member on NBC’s Saturday Night Live in six years. 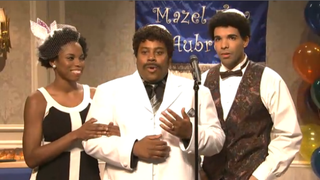 She was featured in several sketches during the NBC show, including the first sketch about the bar mitzvah of host and musical guest Drake. During the sketch, she appeared as the girlfriend of the rapper’s uncle and said, “Mazel Tov.” Later, she appeared as Rihanna and as a girl hosting a pajama party. The 27-year-old is the first black woman to become part the show since Maya Rudolph left in 2007. She was hired midseason after criticism forced producers to conduct nationwide searches for black female comedians. She is a graduate of the University of Virginia and has been a performer with the Upright Citizens Brigade, two groups that helped catapult Tina Fey to superstardom.